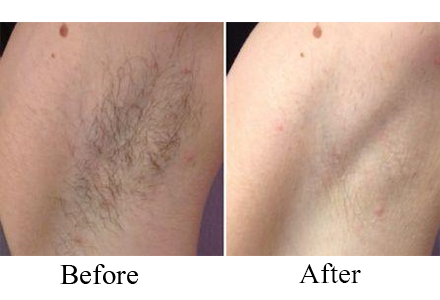 Laser hair treatment permanently reduces unwanted hair so you do not have to worry about pain from waxing, the hassle of regrowth, or discomfort from ingrown hairs. 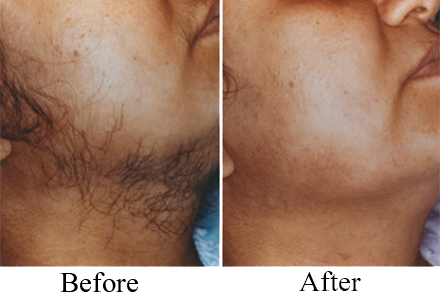 Laser hair treatment is perfect for facial hair removal for women. This method is also perfect for back hair removal amongst other areas on the body where hair presence is considered unattractive. The Laser 'n' Beyond laser hair removal treatment is safe and effective way to remove unwanted hair from any area of the body. Many clients consider laser hair treatment the best and most efficient way to reduce hair growth. This revolutionary process uses medical grade laser that is clinically proven to reduce hair growth without pain or discomfort. This medical procedure uses laser technology to remove unwanted hair with a beam of light that damages the hair follicle beneath the skin. Any pain or discomfort is offset by a cooling mechanism on the laser treatment device as clients might feel a slight stinging sensation. Treatment of a small area can only take up to fifteen minutes while a large area might take a few hours. After the treatment, you might experience redness and swelling for a few hours but soon your skin will return to normal. The best laser hair removal results are seen on dark coarse hair since black and brown hair absorb the photons of the laser light more easily. The most effective results occur when their is a stark contrast between the client’s skin color and hair color. Laser hair treatment works quickly when an individual has light skin and dark hair. However, the high quality equipment at Laser 'n' Beyond has pre-programmed settings that adjust energy outputs according to various skin and hair colors. This modern technology allows our professionals to tailor a specific treatment that suits your needs. The laser has a beam that when applied to the skin will search for large areas of follicles and will heat the root, destroying the follicle. The lasers destroy only hair that is in its active growth phase which up to 85% of our hair is in that phase at any given time. The beam only affects the follicles and not the surrounding tissue therefore making this a safe and easy procedure. Is it permanent hair removal? Laser will not guarantee permanent hair removal, but if done correctly and enough (normally packages of 6-9 are required) most cases will find that the hair will not grow back or will be reduced by up to 85%, leaving it notably finer, softer and barely visible. Laser has been proven that it does not penetrate far enough into the skin to cause any cancerous activity or cell mutation. There have been no cases of laser hair removal being linked to cancer. The beam in which comes out of the laser, only targets the hair follicles not surrounding tissue. 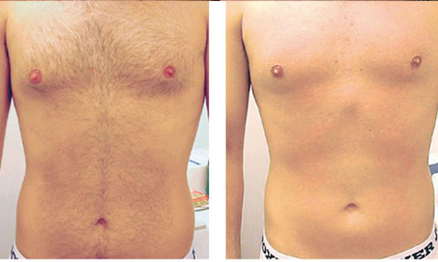 The most successful candidate for Laser hair removal is paler skins with darker hair. Olive skins can still have the procedure done if they have darker hair. Anyone that has blonde, red, white or grey hair is more unsuccessful, as laser is attracted to the pigment of the hair (darker being better). Come in for a free consultation and our Laser Technicians will advise you a proper course of action. 6 – 9 sessions are normally required with 6 week intervals for best results; everyone is different so results will vary from person to person. The skin may swell or redden a little bit after the initial treatment and will go down quite quickly. It is very important to stay out of the sun or sun beds 2 – 4 weeks prior your laser and for 2-4 weeks after laser as the sun can cause pigmentation to the skin if this is ignored. It is very important to listen to the Laser Technicians during the initial consultation.